This, 130m2, spectacular four bedroom apartment in Barcelona, located by Plaça Espanya and the Fira de Barcelona, is a great choice for those heading to this Mediterranean hotspot! This apartment has 3 floors and the area offers easy access to all the sights in and around Barcelona, ensuring that you can make the most of your time in Gaudí´s city! Hostafrancs metro station is situated just 200m from the apartment, from here you can reach the centre of Barcelona in just minutes. 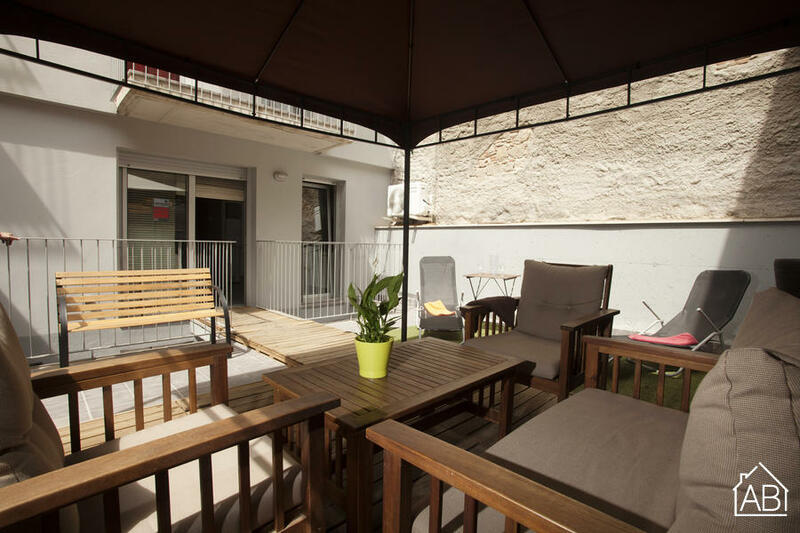 This spacious apartment has four bedrooms in total and sleeps up to thirteen people, it is great for large groups heading to Barcelona. On the first floor there are two bedrooms, one with a double bed and the other with a single bed and a sofa bed. In the space between the rooms and the stairs is a double sofa bed to accommodate two more people. The lower floor is mainly used as a bedroom. There are two separate rooms thanks to a sliding door, offering the necessary privacy. In the first room there is a double bed and in the second room there is a sofa bed. The apartment has two bathrooms and a toilet. On the ground floor there is a toilet and on the lower and first floor there is a bathroom available. Maintaining a sleek and modern design throughout, guests will feel comfortable in the living area where there is a leather sofa and TV available, with two more sofas to be found in the apartment, there is plenty of room to relax after a long day exploring the city. A Nespresso coffee maker can be provide upon request. Guests can take advantage of the fully-equipped kitchen making it easy to prepare some delicious home cooked meals and enjoy dining on the, 35m2, private terrace, which has a direct access from the kitchen and also has stunning teak garden furniture. Outside the apartment you will find yourself surrounded by many unique shops, tapas bars and restaurants as well as a nice local market. This beautiful apartment in Barcelona is perfect for a large group visiting the city and is in a perfect location for making the most of your trip to the Catalan capital.